This is a period in history in Canada and the USA many books have been written about. One of the best is "Dreams, Dust, and Depression," by Philip S. Long. It's so true. One or two things I remember are people being hungry; vacant-faced men looking for work, Mom and Dad keeping other folks in food (Dad was lucky he had steady work,) and dust storms so bad you just couldn't see. Grasshoppers so bad they blotted out the sun, and ate everything in sight, even clothes on the line. Things were pretty bad at that time and Dad couldn't meet the taxes, so we sold our home and moved to Third Street. This was such a let-down to us, but mostly to Mom and Dad. The house was in a bad state of repair, and it took my Father and Mother, and Mr. Bates, who was a builder and a good friend, a long time to fix it up. Maybe this is when I learned about woods and tools and how to do some things with them. The boys were too small. However, Dad over the years made a nice home of it. But I can still see Mom sitting there, among all the furniture and packing cases, sobbing bitterly for a few minutes. Then she stood up and said, "Walter, we've got our hands full, but you can fix it up." 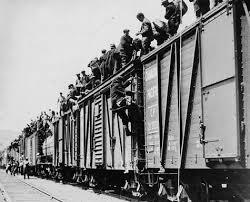 Then there were the hobos, men calling at the back door for food, and riding all over in the trains, looking for work. It was a very sad time, but I am glad I lived through it. It makes one appreciate a loaf of bread, I'll tell you. Letty told me that her mother never refused to provide food to a hobo, but she always made them sit outside on the step, to eat. The Great Depression lasted from 1929 - 1939. Those who survived learned thrift. Their motto was "Use it up, Wear it Out, Make it Do." No wonder my parent's generation scoffed at the throw-away generation that followed them - with just cause. 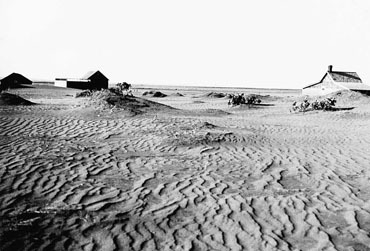 Once verdant farms turned into deserts; drought combined with economic collapse drove most farmers from their land.